Clean up your treasured vinyl collection with the Double Smart Matrix! Not the ultimate, but certainly one of the easier-to-use disc cleaners, this well designed and sturdily built product does what’s required with minimal fuss at a price that serious collectors can probably still justify. Recommended. Doesn’t always vacuum up near the label as effectively as further out. Applicator/vacuum arms don’t ‘float’ as easily as they might and could stress warped discs. 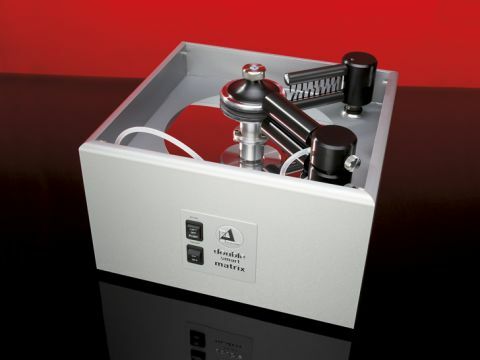 Clearaudio is known for its strikingly individual turntables, tonearms and cartridges. It's hardly surprising, then, to discover that the company also makes record cleaning machines (RCMs). There's quite a range of them, of which the Double Smart Matrix is the latest addition. It's not cheap and at first glance it looks much like any other record cleaner you've ever seen, but unlike most of them it has the killer feature: it cleans both sides of the disc at once. Anyone who has ever cleaned a substantial quantity of LPs will know that sinking feeling that descends as the 'in' pile shrinks at pitiful speed, while one's arms tire of the routine of pushing this, pulling that, turning the disc over and doing it all again.... so anything that makes it less of a grind is to be welcomed. And it's pretty obvious that double-side cleaning is a major contribution in that direction. The basic principle of most RCMs is the same. Spread some cleaning fluid on the disc, then vacuum it off together with any dust, fingerprint grease and other contaminants. The Double Smart Matrix achieves this with two electric motors, one for spinning the disc and the other acting as a vacuum pump. The record sits on a miniature platter the size of the label, and is securely held in place by a quick-action clamp. Clearaudio has thoughtfully provided a liquid seal on each side to prevent the label getting wet. At this point in a normal review we would usually discuss the 'sound quality'. Well, the DSM does actually 'make' a sound, which is a lot like a vacuum cleaner. Before switching the vacuum part on, though, it's necessary to apply fluid to the disc. This is achieved by a pair of combined wetting/vacuuming arms, the lower one is fixed, while the upper is pivoted so that a record can be fitted to the platter. Swing the upper arm back into position, give the bottle of fluid a little squeeze and liquid starts seeping out on to the upper and lower faces of the disc. Once the microfibre pads which contact the disc are properly wet, one can start the motor which spins the disc. It rotates slowly, at about 16RPM, and Clearaudio recommends three to five rotations in each direction (using the three-way switch, clockwise/off/anticlockwise) to spread the disc fluid evenly. Then, and this is the clever part, simply stop squeezing the bottle and switch the vacuum motor on. After a few more revolutions the disc is dry and can be put into a nice new inner sleeve. Even with all this user convenience, the process is far from instantaneous: we reckon on about two-and-a-half minutes per disc. The supplied fluid does a good job and visibly removes all the usual contaminants, as well as reducing both background noise and mistracking due to a build-up of dirt. It's a bit of a Rolls-Royce approach to record cleaning, but if you feel you owe yourself, and your LPs, a bit of luxury we can highly recommend it.